for all of us living in cities it's not that easy to get to lakes, beaches, and hot springs. however the upside to the evergrowing sprawl of spanking new apartment complexes is that the nicer ones have cool swimming pools. if we're going to grow up in an ocean of highrises, freeways, concrete, billboards, cars, and shopping malls, i think it only fair that they let us swim naked in their fancy man-made puddles. also, nightswimming is an easy, convenient warmup to swimming naked in the sun. 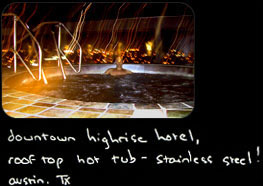 it's darker: you can get away with swimming naked almost anywhere at night, just leave your suit next to the pool. you can go swimming when you get in from going out: it'll clean the cigarette smoke off of you, the chlorine clears up your acne, and the drinks you bought will take the edge off your self consciousness. in an ideal world we could swim naked in the sun legally and for free. sun on wet skin feels... spectacular. thousands of years ago you could do this, but now, we're 'civilized'. so, look for a legal place to swim naked. there are occasional legal lakes, beaches, and hot springs. or, find an unpopulated place and go for it: just be discreet and leave a suit on the shore.